Sustainability is a big issue when it comes to any design process, so as the eTextiles. 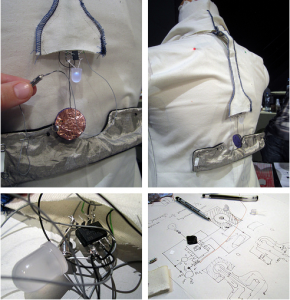 There has been many attempt with eTextiles and energy harvesting in the field. As textiles are often used to cover surfaces everywhere, it has a good potential on harvesting energy from its environment and contribute to produce energy in cleaner ways. The other aspect of sustainable design is reducing its environmental impact. e-Waste has been a topic for decades and when the eTextiles come into the mass market, it will add itself to a new type of e-Waste mountain. From its resource to recycling scheme, what are the agenda for eTextiles designers today? Since the 2nd summer camp, Energy Harvesting is a recurring topic – from Konstantan to home-made solar cells to energy harvesting circuitry. Maybe this is the time to sit down and conduct a series of planned experiments on eTextile energy harvesting with proper research and knowledge? Designing for the loop, searching for better, more sustainable solutions is not as simple as we would like it to be. One of the reasons is that “better” design depends largely on contexts, numbers, materials, their life-cycles and so on. Life Cycle Assessment (LCA) is a tool which helps us to grasp these complex interconnected parameters in order to evaluate our design decisions. What are the parameters in eTextiles that designers can consider when designing for the loop? Is it the material content? the way it is produced? how the electronics are embedded? how it is washed? Let’s think about what approach we, as makers and designers, can take toward more sustainable eTextiles future. Zero Waste Designs…. Meg Grant’s Swatch submission this year is a Zero-Waste Pressure sensor! Hi, I feel really close to this topic and it’s already part of my thesis proposal of my final year master. So, I would love to be in this focus group because I also already started to research and a bit experiment on it. In a way, I feel more focused on sustainable smart materials or conductive materials, not specifically using textiles but for sure to apply the same criteria for a sustainable wearable tech and have a zero e-waste. Hello, I would like to join this group. I am currently working on making the mi.mu gloves textile (mimugloves.com) design sustainable and our plan is to make an e-textile version of the gloves next. I think as the area of e-textiles grows, sustainability should be an inherent part of how we design. Many e-textile and wearable tech base products are in development and prototype stages there is an amazing opportunity to look at the approach to scaling up and manufacturing and how this can be done sustainably. There is a real chance to influence how this will occur. I also think this relates well to the industrialisation topic, which would have been my second choice. Knowledge Buffet- share the outcome!